I would gladly come again! I enjoyed the lovely sea-view from my room and the location nearby everything. Comfortable bed and good breakfast made it possible for me to start enjoying lovely Nice. Wi-fi operated very well! This web-user gave a score of 1 / 5 to Vacances Bleues on march 2019, but declined to leave a comment. My room with sea view and balcony was lovely, fresh renovation, new furniture, everything was immaculately clean, neat, very beautiful. 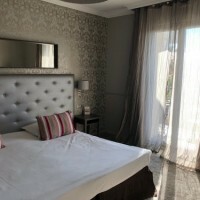 I was in this trip 7 days in France, in 4 hotels (Marseille, Menton, Beausoleil, Nice). 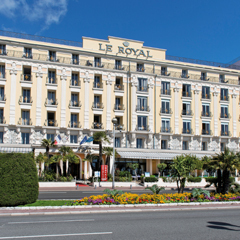 None of the hotels can compare with the beautiful LE Royal. 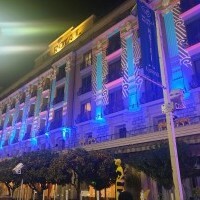 It is a pity that I was in this wonderful hotel only 1 day. It was the best day of my whole trip. Now this is my favorite hotel, when I will come here if possible. The location is wonderful. Our room facing the ocean was nice but needs some improvement. Do not bring a lot of clothes. No room in the closet. There could be a dresser as there is enough space in the room. Why not put over the doors hangers for our coats. Little details that could help a lot.